Anyone of any ability can join a comp and compete at an enjoyable level. Floorball is new to most people in Australia however the cross-over skills from many sports mean it is easy as to pick up. There are three main levels of competition. Then there are the once off 3 on 3 tournament like at www.surfest.com. April 13 and 14 2002, which are open to divisions primary school, high school, pubs/charity, 'hockey' codes, and elite. When first trying out floorball the cost is $5 a session. When joining our team for a season (12 games/wks), the cost is $50 plus AFA registration ($30 for snrs and $15 for jnrs). Local competitions start in Term 1 and Term 3 and are both preceded by 3-4 skills/drills weeks and school/uni holidays are avoided. In July there are camps operating for juniors. This is the business side of Floorball and works out to be about $10 a game. Proper rules, proper referees, proper line changes and trainings. 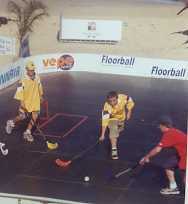 Merewether Thongs are a feeder club to the Newcastle Crabs who won the first ever Australian Floorball tournament in 1997. Teams in the state league currently encourage more and more aussies to take part but usually consist of 5-6 foreign players as well. Costs vary somewhat from tournament to tournament. The 2002 Aus titles are being held at Albert Park, Melbourne - the premier location for the Australian Grand Prix and now for Floorball! At present the shirts and socks are supplied at the venue on order. The shorts are navy blue. Cost of the shirt is $20 and the socks are $10. All players are required to wear uniform once playing for more than a couple of weeks. The AFA registration entitles each player to membership discounts on equipment and videos, also helps with insurance coverage of coaches and officials, and also helps us develop the game and cover all the expenses associated with developing a new sport to give you more opponents and team-mates in the future. For more info on AFA registration benefits visit www.floorballaustralia.org.